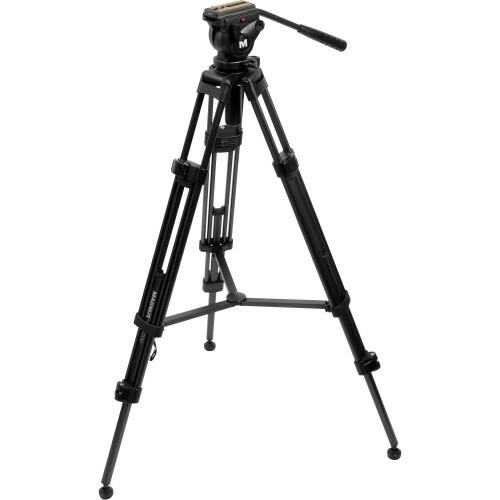 The Magnus VT-4000 Tripod System with Fluid Head is a stable, sturdy video tripod made from anodized aluminum that can support loads up to 8.8 lbs. The two-way fluid head provides smooth operation, and features a half-ball mount with a diameter of 65mm, with left and right pan bar mounts. It comes supplied with one pan bar. In addition, unlike most other heads in its class, all the head controls are positioned on the left side of the head, which leaves your right hand free for the panning handle. The VT-4000 tripod system weighs 7.9 lbs. Its 2-stage leg design allows you to adjust the height of the tripod from 27.6" to 59". A middle spreader and passive counterbalance provide enhanced stability to the entire system. The VT-4000 also has separate pan and tilt locks, and a bubble level for precision leveling. The fixed counter-balance spring incorporated in the head will help with smoother tilt movements. Its provided quick release plate features a standard 1/4"-20 mounting screw with a video pin, and has a sliding range of +20/-25mm - to enable travel capabilities - essential in balancing uneven configurations. The head's tilt angle is adjustable from +90° to -60°.